"there's a more private beach on the other side of the island. bring them there". 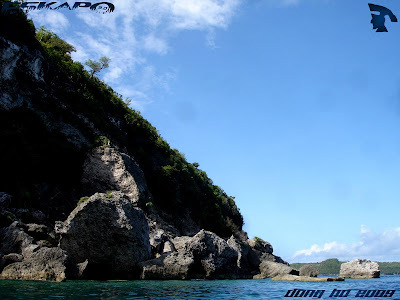 those were the words given by the banca owner to our guide when we left Marinduque's coast. we left the pebble beach of Gaspar to continue with our island trip. 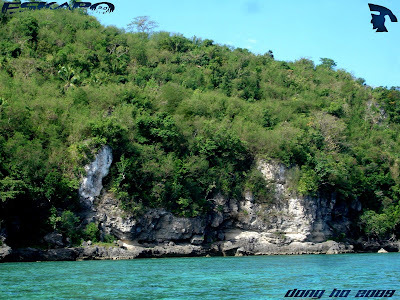 this gave us a view of the whole island which is greatly covered with green plants. 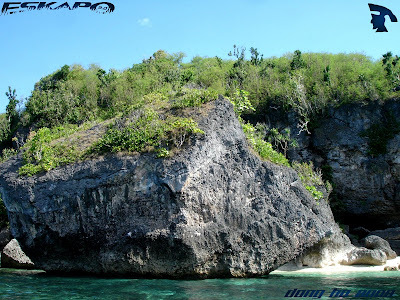 Gaspar island is a huge rock island over a crystal clear water of Tablas straight. we were slowly moving following the island's coast giving me the opportunity to take photos. water was relatively calm that time. 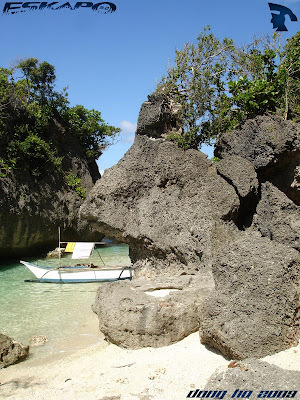 the different rock formations are similar to the ones i've seen in hundred islands in Pangasinan. 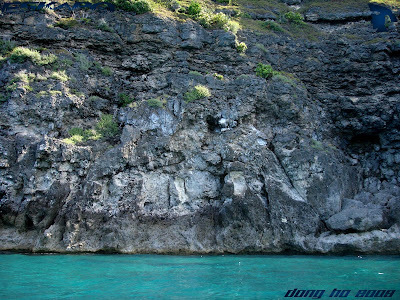 matched with a very tempting Cyan colored waters, i should say that snorkeling is good there. 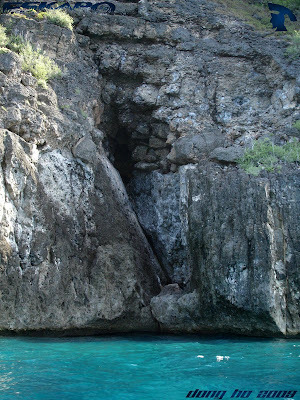 the island of Gaspar is considered as a marine preserved monitored and governed by a community. 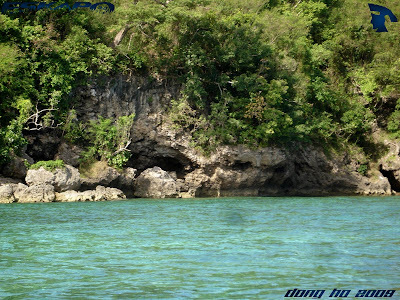 so expect fishes and other sea creatures roaming around the island. as we went farther, we sense isolation, as the big island of Marinduque was not visible on that side. mossy boulders and huge rocks came to view. we were now on the Southern part of the island where small beach coast came to sight. we saw a group staying in its beach. their boat was docked on one end. our guide says, that we'll be docking on another area. 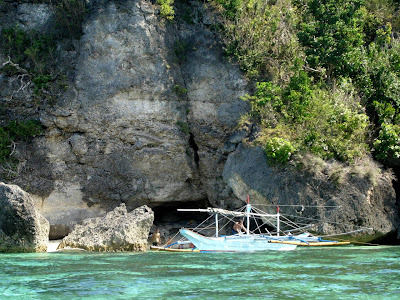 this island has caves which the locals already explored and found some ancient trading and ceramic plates and jars. which reveals that long before, this island became home to traders. 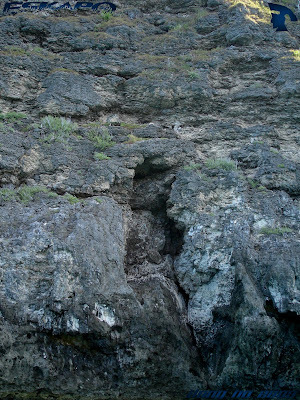 we continued to move until we reach a huge rock which seems to be hiding something. our guide tells us that we'll dock behind that rock. 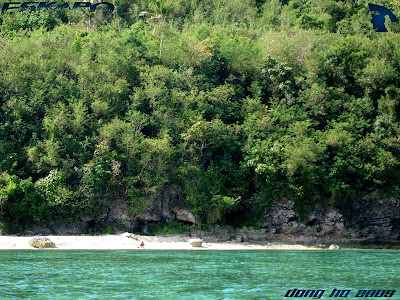 a small beach with white sand revealed to us. a perfect place to unwind after a busy Moriones day. it was indeed a beautiful isolated beach side. 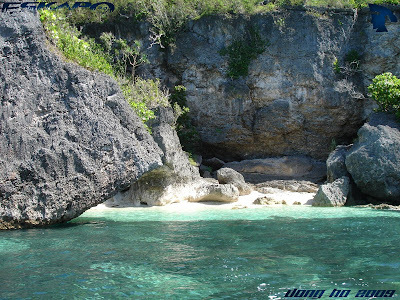 one can explore by walking over rocks that lead to the other nearby beach of the island's Southern part. some rocks are sharp making rock climbing riskier. there are shaded areas where one can read a book or just enjoy the horizon. it was definitely the best hidden side of this island. we stayed there for a good amount of time until my travel friend Nadz turned tan. we left the island just in time for lunch back to the town of Gasan. Tsk. Nakakabaliw ang tanawin ng islang ito. Ganda! That's a nice hidden piece of paradise. The water looks so clear and inviting. It looked to me that the island is all limestone. Is it? 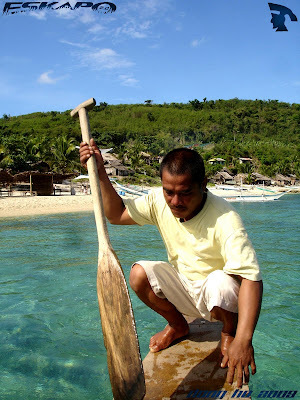 Nakakaingit naman sa atin, there are so many islands, big and small, worth a visit or two. Hi Dong, thanks for visiting my blog :D! 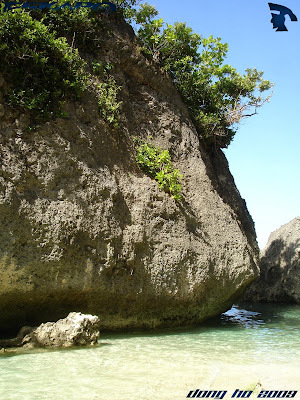 Since it was my first and had only limited time next time I will really explore Marinduque. I will consider these places. Great captures btw ;) ! Have a nice day, been busy and haven't been blogging yet ! Kaya gustung gusto ko ng ulan eh! Nadidiligan mga halaman.. And of course the blue skies and waters! Ganda. Hmm, teka, ang tagal mo na sa Marinduque ah.. Hanggang kelan ka jan? 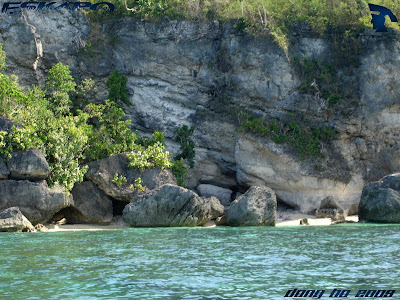 Nagtanong eh noh..
that is a perfect beach hideaway dom. kahit ano gawin nyo jan pwede hano? pwede kaya jan na iwan kayo ng bangkero then balikan na lang kinabukasan? medyo risky yata no? bakit parang gusto kong maging sirena all of the sudden? this is great. parang ang peaceful ng dating. dito nalang sana ginawa yung movie na "The Beach". wadya think dong? Kinda scary knowing that the place is already isolated. But it's a fantastic place! The water is soooo inviting! Very beautiful scenery. The water look so clear and clean and so inviting. hay kuya dong kung anak lang ako ng bilyonaryo. sasama ako sa iyo sa iyong paglalakbay sa magagandang isla sa pinas. shock ako lagi sa mga scenes. men! prang paraiso naman tong place Dong! tsk...gaganda ng mga places na binivisit mo. that is paradise found. what else is there to say except i wish i was there. Wow, this is a perfect isolated island hideaway. The crystal clear blue water is absolutely enchanting. 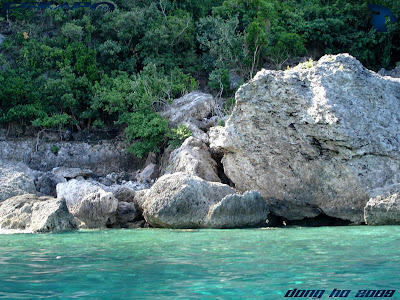 Super clear yung water, unbelievable na may ganyan sa Marinduque! Hi Dong. Those pictures just transported me to a hidden paradise. What a beautiful place to spend a holiday. I'm sure you took a dip into those crystal clear waters. The rock formations are quite amazing! 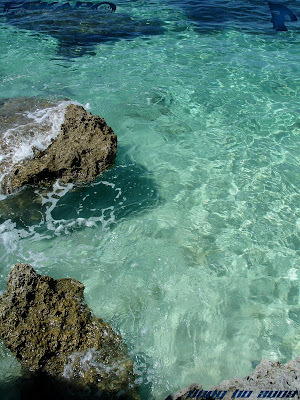 Wonderful crystal clear water, green, rocks. Fabulous sceneries, Dong! 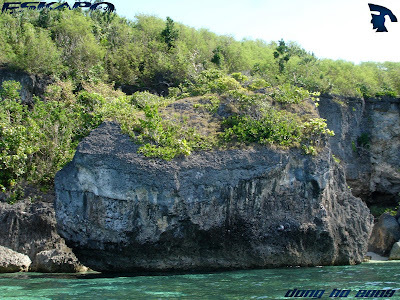 parang nasa guimars island rin to. 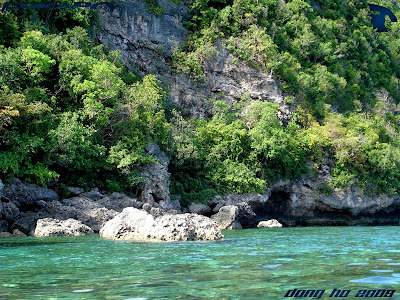 This reminds me of the small granite islands of Palawan so much. 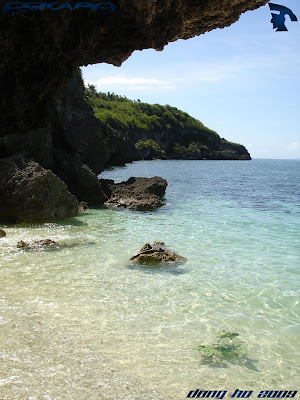 yan ang perfect getaway! walang sagabal, walang distracting modern structures, walang internet (??!!). yan ang mga nooks and corners ng mga islands natin na kung di mo pa mapipicturan, di namin malalaman na nag-eexist. Ang linaw ng tubig... sarappp maligo. Ang dami pa ring di napupuntahan sa Pinas... haaay one day isang araw. Great pictures. waaah. parang maraming isda riyan. sarap mag-fishing. haaaaay. 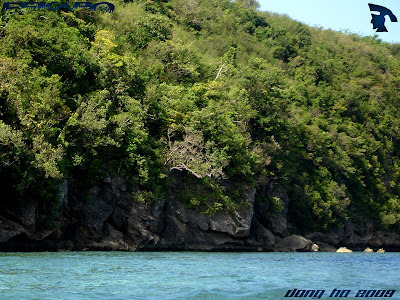 Parang on the way lang to Abra de Ilog to Puerto Galera! private beaches are the best! it's like discovering hidden treasure! lucky you! 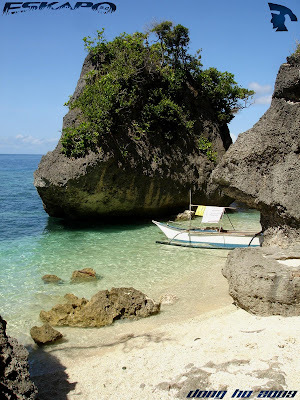 I would love to visit Marinduque and see this serene island. Gorgeous. Thank you for your patience and for bearing with the technical problems on the website. Thanks for visiting Norwich Daily Photo and leaving your comment. Come back tomorrow for more of the Keukenhof series! WOW! 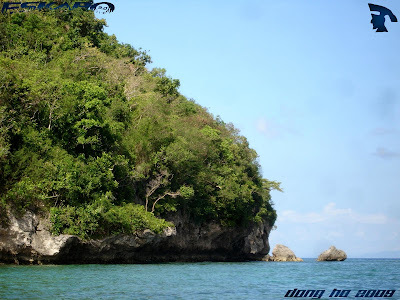 This is the first time I've seen pictures of Marinduque, and I am totally impressed! Ang ganda ng tubig grabe! 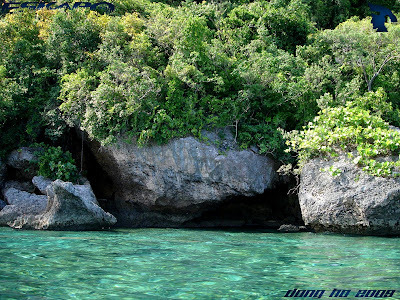 It's almost at the same level as the waters in Coron don't you think? great pictures! i hope i can visit this place. pristine, wild and pretty indeed. What a place to spend time and forget about work ! ang ganda! parang walang katao tao talaga... sarap mag relax! Nice collection of pics. Thanks for sharing.